We left off from the previous issue with Prime–Kevin–looking for Hardcase, but winding up facing an angry Prototype when he accidentally ruined a photoshoot. We pick up here with the two fighting. They do some real damage to each other before a fire breaks out, which forces them to attend to onlookers’ safety. Unfortunately, this iteration of the Prime body is rapidly destabilizing, so Kevin has to fly off, leaving rescue stuff to Prototype. Though he makes it near to his house, he crashes onto the family car instead. As he struggles to break free of the now-defunct Prime body, hands break into it from the outside, getting him out…Kevin’s father! He helps Kevin avoid his wife’s suspicions, and warns Kevin NOT to let his mother have him tested for drugs. He laments that this wasn’t supposed to happen. A brief interlude shows some demon making its way into the world, utilizing an open portal from Boneyard transporting an unconscious Mantra (with a footnote to Mantra #3!). Despite his mother trying to convince him otherwise, Kevin goes to school the next day. On the way he has a verbal fight with his friend Scott over his recent "weirdness." Brushing him off, Kevin next finds Kelly…and (rather creepily?) gets her to talk to him by telling her he knows Prime. 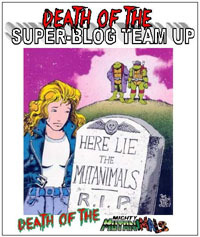 The two soon notice a commotion nearby and rush in–Kelly thinking it could be Prime, Kevin trying to stop her…and they’re confronted by Maxi-Man…a cartoon come to life (the form the demon from earlier has taken) and threatening to teach them fear. This is a rather complex issue in its way, and I feel like it’s certainly that modern comics seem so completely geared for collected volumes. We have numerous settings and plot points through this issue, and it’s not hard for me to imagine how this issue could easily be stretched into 2-3 issues at least, given the "decompression" of modern comics. Story-wise, this isn’t bad. We have new developments–particularly in Kevin’s dad finding out/knowing he’s Prime. Four issues in, only the third where we’ve actually known Kevin, and already his dad knows, so it’s not gonna be JUST some kid having to hide from both his parents while doing all this…and that brings with it a different-ish (at least for the time) level of stuff. We have the fight with Prototype that seems rather fitting. It’s a natural meeting, and seems a legit misunderstanding. Of course, with both being rather hotheaded, it makes sense they’d fight first…though they don’t "get a chance" to make up or "realize" they’re both "good guys" and such, which leaves things open for development down the line…a slightly bent trope, I guess. Kevin definitely comes off as "a teen" here, and I think the authenticity of it comes partly from how ridiculous Scott is and their fighting. I’m sensitive to others thinking someone is "creepy," just for not being some image of what society sees as "normal," so I feel for Kevin. However, I can definitely see very much–especially as a late-30s adult myself–how Prime having any particular interest in Kelly is problematic. I knew to expect the fight with Prototype in this issue, between the way the previous issue left off and the covers for this issue. Yup–two covers! I despise modern "variants" for their absolute ubiquitousness, over-hype and over-use. 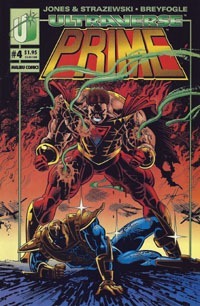 But in this case, for Prime #4, the "variant" is simply showing us a victorious Prototype standing over the beaten Prime…in contrast to the cover showing Prime standing victorious over a beaten Prototype. Both covers exist…so just looking at them…WHICH ONE is "real"? They’re both there…but can’t BOTH be "accurate," so you actually have to read the issue to find out! And they look so similar otherwise, it’s not like some completely different artist with a completely different style has done some completely unrelated, irrelevant generic image that has trade dress slapped on to be sold for a premium to someone already buying the issue. And of course, a couple decades after initial release and easily being able to tell the covers apart and such, I don’t mind hunting the OCCASIONAL variant and seeing them as fun, where the modern counterpart is extremely annoying and off-putting. Retroactively, though, I am a bit annoyed, as I’d wound up with the Prototype-victorious cover initially, and it was years after the fact that I ever learned there were two covers. We’re shown (and told) how others are seeing Kevin. The art, though, has something to it that just makes Kevin look odd to me. I’m sure it’s that over the years I’m so used to seeing imagery of Prime and virtually nothing with Kevin (and I can’t even think of any covers offhand that have Kevin rather than Prime) so I’ve spent 20 years with easy visuals showing Prime but not really seeing Kevin. Loathe as I am to phrase it this way, it’s the simplest way to do so: Kevin LOOKS a bit creepy at points, with the coloring and shadowing, even as that conveys mood and tone. There’s also a sort of ‘house style’ in seeing the non-Prime characters: Prototype, Boneyard, Mantra–that makes it very easy and natural to see them in this issue. The "visual sound effect" "SHAK" of Prototype blasting Prime in the face on the opening page is a bit distracting as it’s basically the same size as the title of the issue, and both seem stylistically very similar, of showing off computerized fonts that could be dropped onto the page. Very ’90s, but looking back, a bit tacky/flashy. 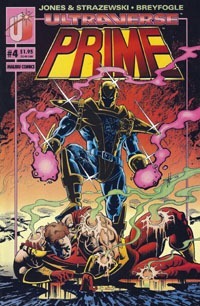 I’d read Prototype #2 well ahead of this issue–Prime #4…though in the reading, I learned that it takes place after this issue. Meanwhile, this issue takes place after Mantra #3, and benefits even more from it. We already had just a brief bit with Boneyard in that issue…but here we see that there’s even more to that picture. These interactions also feel organic and like what would happen when these titles and characters are all occupying the same world/city and all that. It’s possible to read this issue without the previous issues. You won’t know/"get" everything without ’em, but then, the bare-bones context is there to follow along in this issue and pick up on Kevin/Prime, his relationship with his parents, how he is with Kelly and she with him/regarding Prime, even the fight with Prototype. Basically, if this was your first issue, there’d still be plenty for you and you could either choose to seek out the previous three or move forward learning from context. This does not feel "simply" like it’s "merely" the 4th serialized chapter of some rigidly-structured 6-part graphic novel. 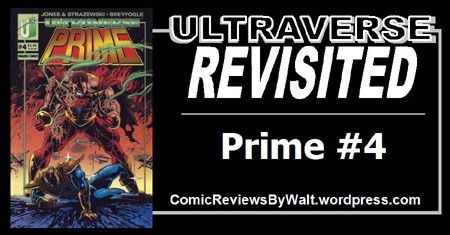 If you’re at all familiar with Prime, this wouldn’t be a horrible issue to seek out as a one-shot; but as these early issues seem to be total bargain-bin material, I’d recommend spending the $2-4ish to get all four issues to read together. NECA 1/4 Scale Raphael: Finally!